Tick off the places you've been with this map—and the teensy flags that come with it. Sometimes it's the little things that give us the most joy. In this case, those "little things" are flags—miniature versions attached to pushpins that tick off the countries you've explored. 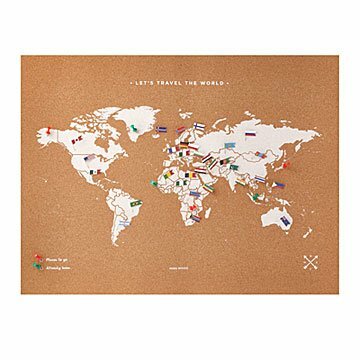 Made from sustainable cork, this interactive map allows world travelers to relive treasured memories, from aimless trots in Tokyo, marked by Japan's stark white-and-red flag, to seaside dinners in Barbados. (They've got a trident on theirs. Pretty cool.) It also comes with adhesive, so you don't need to worry about nailing holes in your wall. Made in Spain, where their bandera is super bright. Clean with a dry cloth if needed. I love this map and the world flags that come with it. You can hang it on the wall and pin all the places you've been. A beautiful way to remember your adventures! It feels natural and organic. I love being able to track all my trips with the world flags and placing pictures on the map. Good quality!